The Tesla Model S has achieved an across-the-board 5-star crash test rating from the NHTSA. 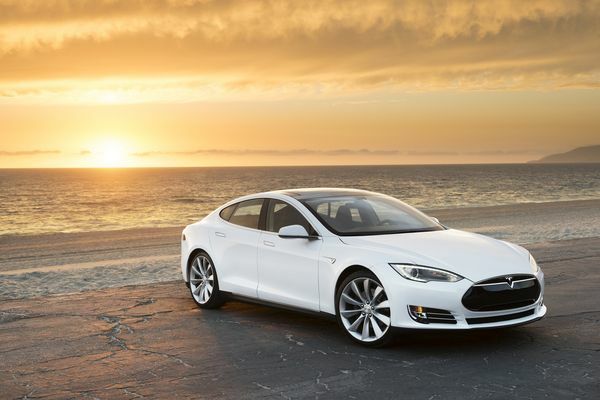 Tesla Motors announced today that the Tesla Model S achieved the highest safety rating ever recorded in NHTSA testing. The agency has awarded the car a 5-star rating across the board, in every category and every subcategory. In order to claim they achieved the highest score ever, Tesla took a look at the details of the test report. About 1% of all cars get 5-star ratings across the board. Safety levels better than 5 stars are captured in the overall Vehicle Safety Score (VSS) provided to manufacturers, and in those detailed ratings the Model S achieved a new combined record of 5.4 stars. This lets Tesla Motors claim "Of all vehicles tested, including every major make and model approved for sale in the United States, the Model S set a new record for the lowest likelihood of injury to occupants." For head-on collisions the front trunk (a.k.a. frunk) forms a huge crumple zone to absorb impacts. As Tesla puts it, head-on crash safety is "fundamentally a force over distance problem" meaning that the larger the crumple zone the more time the vehicles have to come to a stop and dissipate all their energy. Because the Model S is an all electric car, it doesn't have to use the front compartment to store the gas engine. That left Tesla's design engineers with a large empty space in the front, which they made into the front trunk. The NHTSA side pole intrusion test mimics those collisions where you strike objects like telephone poles. The Model S is the only vehicle to score in the "good" category. Tesla cites a comparison with the Volvo S60, which is also 5-star rated in all categories, noting that the Model S preserved 63.5 percent of driver residual space vs. 7.8 percent for the Volvo. To get this result Tesla's engineers nested multiple deep aluminum extrusions in the side rail of the car that absorb the impact energy and transfer load to the rest of the vehicle. Poles either get sheared off or stop the car before the pole hits occupants. For rear collisions, Tesla wanted to add extra safety because of the optional 3rd row of seats. Tesla factory installs a double bumper if the third row seat is ordered. The rear trunk area is also huge, and would serve as a large crumple zone in its own right. Because the Tesla Model S battery pack is located low in the vehicle body, testers weren't able to get the Model S to roll over in normal rollover testing. Testers had to employ "special means" to induce the car to roll over. Finally in the roof crush test, the testing machine broke while trying to crush the Model S. Therefore no precise score is known as to what's required to crush the Model S roof, but they think it's more than 4G's of force. That means weight equivalent to four fully loaded Model S's could be stacked on-top of a Model S, and the roof will hold it.